I recently had a wonderful field trip with my ESL students. Within the unit of work on Design, we travelled to the Sheikh Zayed Grand Mosque to see the design features of the mosque. I take students twice a year and usually ask them to bring a camera (i.e. phone) with them to document what they see. However this only captures limited amounts of design features. What about notes from the tour guide? What about asking tourists for their impressions? As soon as we had implemented iPads into our classes, I knew what had to be done. 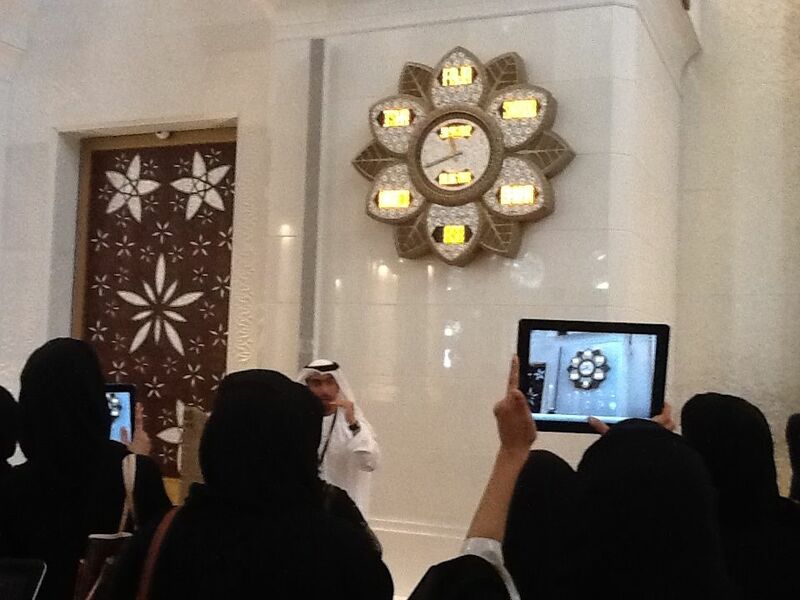 Going to the mosque is towards the end of the unit of work so students have already learned about design features. Students have come across videos and readings explaining terms and aspects. We also tie in Islamic aspect to design and features that are found in this region. Specifically, I ask students to take photos around their home, neighborhood or the university to capture what they’re learning and to visualize the term or concept. This can be problematic because female Emirati students may not be allowed away from their home without a male family chaperone. On the day, students bring their iPad and start documenting the trip from the moment our buses arrive. They know they will be asked to present what they saw at the mosque so they start collecting resources to use. Typically they use photos but some create small videos giving a dynamic 3D perspective instead of the static 2D image. Students often walked around the design feature, like the design of a pillar, to capture all sides and views of it. But while on the tour this time I encouraged students to record (audio only due to tour guide’s rules) certain parts of the commentary. Usually we all just tag along and there is little interaction but since we’re recording, students want to get their voice heard and ask follow up questions. They also took photos and annotated on them in Skitch to remember what design feature they were documenting. As soon as we arrived back to our class, I witnessed girls starting to incorporate their photos, videos and audio commentary into their presentations. They were keen (excited?) to relive that experience and start preparing in their chosen apps. Some chose Keynote to present face-to-face but others chose ExplainEverything or iMovie to make a movie to play for their audience. I was amazed at the connections they were making with the design features we had studied and they demonstrated this visually. They were also quite curious when reviewing the commentary. The audio quality wasn’t great so I was listening and helping students a lot. But students sought clarification and explanation from me and the internet to understand more about the commentary. If we hadn’t recorded it, the learning opportunities would have been lost at the point of delivery. During our presentation Bazaar (MarketPlace styled presentation), half the class presented in a room at the one time (and then swapped) and other students and teachers went around to hear students present. Students who had movies stood next to their movie and played it on the iPad but others spoke live. This was very successful because at lots of points throughout the process, students interacted with the language and content in different forms and both virtually and in real life.